It's like falling in love all over again. I was without my car for two months while it waited for its new engine. In that time I was given two replacements. 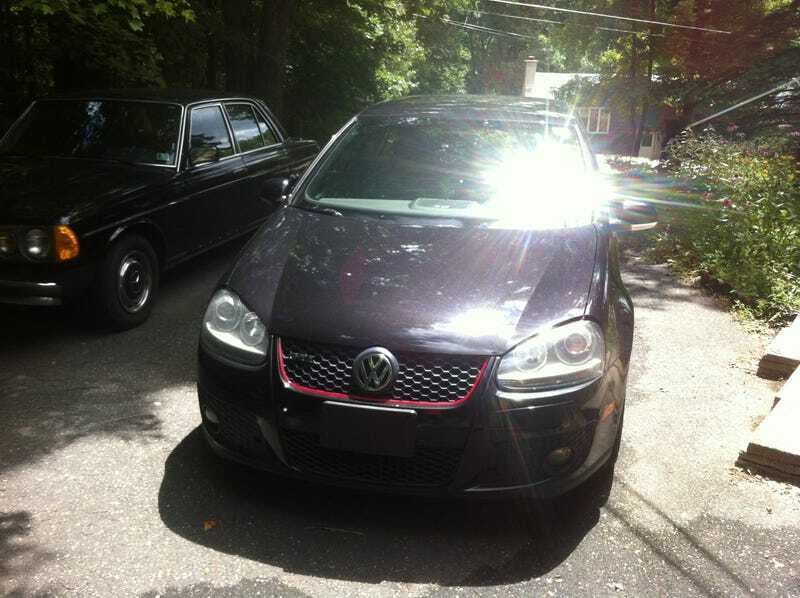 Firstly, a Chevy Sonic sedan(sideshowbobughgif), then a brand new Passat. The Sonic was really fun to drive with its skinny tires and high center of gravity, but had that infamously cheap interior . The Passat, while it importantly felt like a VW to drive, the rest of it has been ravaged by the beigekrieg. With interior plastics presumably sourced from Chevy, the worst was the thin layer of diving suit rubber that covered the steering wheel. There is no way that is not peeling off in a few years. These things made the initial sweet plaid embrace all the more pleasant. "I've missed you." I said out loud, as I grabbed the leather wrapped steering wheel. I sat there for a few seconds taking it all in. Then I started the car. "Bluburble." It said out loud, as the brand new engine came to life. The ride home was superb. The handling as crisp as ever, that exhaust note as raspy as always, that engine responsive, that DSG flatulent on the upshifts. I like cars too much.